Initiating from area of just 500 sq. ft. the store has now become the multi-branded outlet with area 15,000 sq. ft., marching towards the distinct goal of services. The firm has two retails outlets, at prime location on Dr. Yagnik Road of Rajkot. Eminence fashion store not only of Men’s but also for children and Women’s is giving fashion in the form of service to the cities of saurastra since 1989 and has huge influence over the people not only from Rajkot but whole saurastra. This is the evidence of our crusade towards fashion, service and quality. Since adolescence Harish Bharani and his brothers have dream to providing eminence fashion with style and comfort to populace of saurastra, are factually chasing their dreams with natural quality of winning people’s confidence. Commencing with small unit 1989, gradually they initiated tailoring unit and fashion store in 1996 and named “Blue Club”, History began then, slowly and steadily team and operation expanded marching towards the distinct goals of service, the only constant was sustained quality. All this ultimately gave BLUE CLUB a shape of grand store. The positive attitude and approach towards any situation and state have always supported and sustain BLUE CLUB vision. 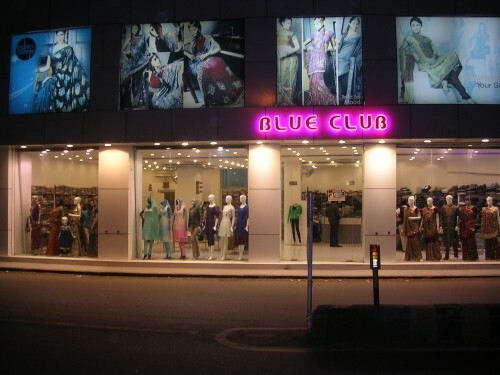 With this approach since many years BLUE CLUB had became the prominent multi-branded fashion outlet in the cities of saurastra. We give preference to comfort over the brands, hence we at Blue Club gratify the customer of varied classes with diverse brands by service, quality and we provide with them enormous collection of casual garments for regular wear and colleges, formals and semi-formals garments for offices and extravagant and exclusive garments for intermittent party wear. Imperial Bridal collection, extravagant and extremely elegant, these are ethnic Indian garments and stylized western and indo-western garments with a touch meant for traditional Indian occasions and parties and formal suit and blazer for astounding corporate.